How many people attended the first Iron Bowl Game? I have found two different accounts with widely contrasting numbers as to how many attended the 1st Iron Bowl game in Birmingham. One gives an estimate of 450 and another says there were 5000. I would love to know the correct number. 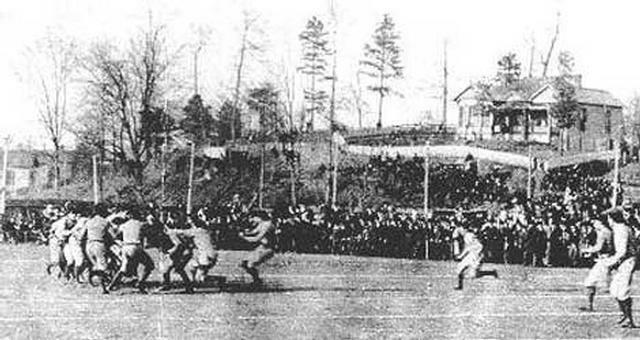 We do know that the game between the University of Alabama and Auburn took place Birmingham’s Lakeview Baseball Park on Feb. 22, 1893 at 3:30 p.m. That historic game saw Auburn walk away with a 32-22 victory. Little did the handful of football fans realize what would develop from the first encounter. The players were even treated to special meals at their hotels and most traveled by train to the game. 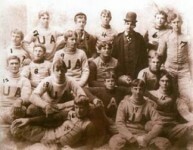 From the time of the series’ conception until a 6-6 tie in 1907, Auburn dominated, winning seven of 11 games. 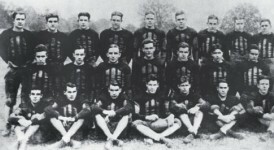 The early years were highlighted by intense, hard-nosed football, promoting the traditional reasons the rivalry became so popular and important to football fans in this state. 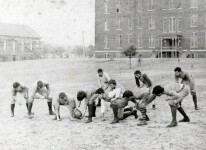 More than 100 years later, the game would become the state’s great divider. Lakeview Park was a park in the Lakeview suburb of Birmingham located at the intersection of Highland and Clairmont Avenues. The 43-acre park was laid out in 1884 by the Elyton Land Company around a man-made lake which was created by damming up springs in the area. Various events occurred in the park, including opera performances on an island in the lake. The park was accessible by the streetcar system that ran along Highland Avenue. One popular attraction at the park was the Lakeview Pavilion, which contained a swimming pool, skating rink, bowling alley, and dance floor. 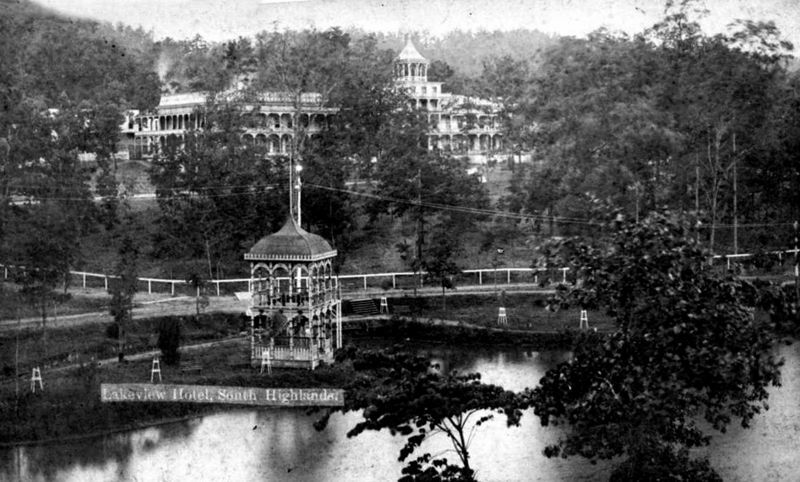 A hotel was built at the park in 1887, which was visited by Presidents Grover Cleveland and Benjamin Harrison. The Lakeview Theatre, a covered stage for open-air concerts and performances, opened in November 1890 with a performance by Mrs. General Tom Thumb and her Japanese Troupe. The Summer of 1891 featured a lavish performance of Gilbert & Sullivan’s “H. M. S. Pinafore” staged on a replica ship floating in the lake, which was surrounded by electric lights. Later seasons fell short of that early high mark. The Alcazar Opera Company took the stage in 1895. Promoters advertised additional security for unescorted ladies during the1896 season headlined by Trilby O’Farrell. In 1897 the theater hosted the Albert Taylor Company and a demonstration of Thomas Edison’s Vitascope (invented two years earlier by Charles Jenkins and Thomas Armat, but marketed by the Edison Company). In 1901 the Elite Opera Company began performing at the park. The park also was home the Lakeview Baseball Park which hosted a number of events. 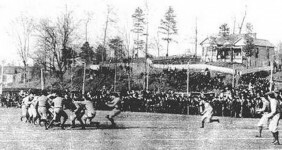 Arguably, the most important event that occurred at Lakeview Park was the first football game between the University of Alabama and Auburn University, which occurred on February 22, 1893. 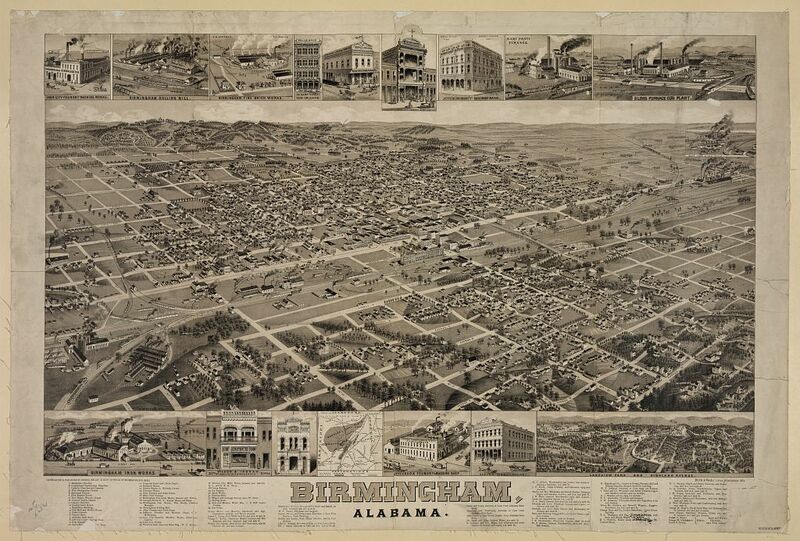 The next time the Iron Bowl was played in Birmingham was in 1902, after Lakeview Park closed. Side Note: Lakeview Lake, now on the Highland Park Golf Course, was the site of one of the most heinous murders in Birmingham history. 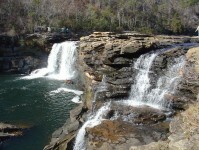 Here the body of Mrs. Hawes was found. 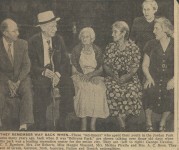 The so-called “Hawes Horrors” earned the Magic City unwanted national press. 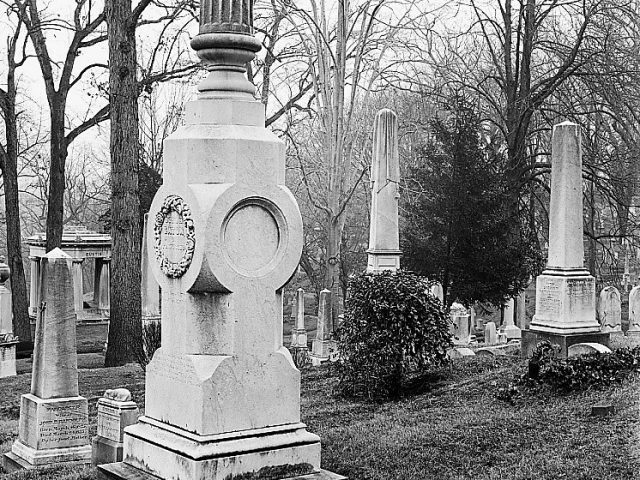 On December 8, 1888, the bodies of Emma Hawes and her daughter Irene were found bound in chains at the bottom of the lake. Richard Hawes, already in custody for the death of his wife, became the target of a lynch mob at the Jefferson County Jail. Eventually, the hotel lost patrons as they went to visit the East Lake Park. 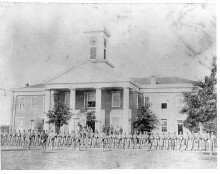 The hotel closed and became the Southern Female Institute, which burned a year later. The Lakeview entertainment district retains the name of the park in the area. A section of the former baseball field was preserved as a grassy corner outside the Compass Bank operations center, with a historical marker describing the first Iron Bowl there. Today, Lakeview Park is no longer there. 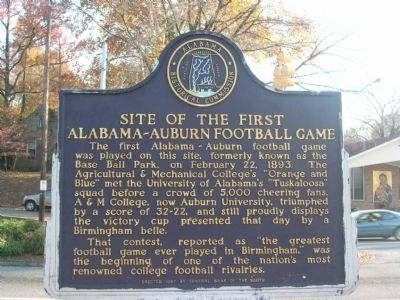 But you can find a historical marker of the first Alabama vs. Auburn football game in front of a BBVA Compass administrative building. I was there. Auburn cheated! I don’t know, but I do know I love my Auburn Tigers, and I BELIEVE! Were you there Joe?!? Is this a trick question? Charles Woosley was there ask him.. 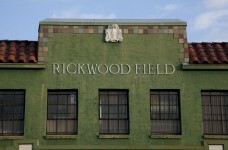 The site is located at Clairmont ave.and 32nd st south. Dan Faverio I mean were you at the first Aub/AL game? W.O.W. Auburn v Wisconsin for the national championship? Before they built the bank building you could kinda see the layout of the field. 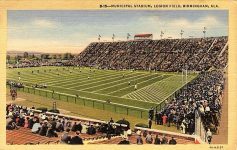 For many years, I thought that the game was played in Lakeview Park (now buried under various medical buildings, etc. ); even the plaque memorializing the game was posted there, on one of the entrance columns of the park. We saw it daily as we entered the park for recess (Lakeview Elementary, now a lawyer’s office building … I think, was across 28th Street from the park). That was a cool park. Your the first person I’ve seen mention the school or the park in years. Frank Hopkins: I grew up 2 blocks from the school. 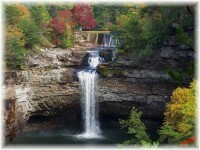 I have pictures of the oark, the school, the library in the school, etc. 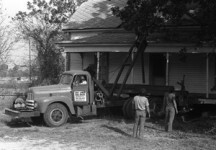 from the early to late 60s. I was there in 77-79 I’d like to see the pictures one day. I have them digitalized. I’ll send them to you. Where did you live back then? I lived in east lake but went to school there. Can’t remember how or why. I’ll have to ask my mother. Every time I go to st Vincent’s. I try to picture where the tunnel under the street was, and the old stone building in the park. There on Clairmont Ave by the Pig , at least that is what I believe to be true. Anymore thoughts out there? Saved aas a favorite, I realy like your site! I love the information you provide here and can’t wait to take a look hen I get home.